A former British Lion stepped into the Dragon's Den on Saturday – for Dalziel Rugby Club's 21st Festival of Youth Rugby. 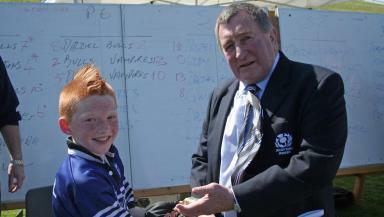 Ian McLauchlan, the current president of the SRU and known throughout the rugby world as Mighty Mouse, was amongst the hundreds of supporters who came to enjoy a feast of rugby laid on by some 45 teams, from Primary 3 through to Under-18, at Dalziel Park, home of the club's youth section, The Dalziel Dragons. In glorious conditions the teams from all over Scotland, plus a guest touring team from York Rugby Club, displayed abundant skill, fitness and commitment – the very spirit of rugby personified by the late Alan Calder, the man who initiated and developed the festival 20-years-ago. SRU president McLauchlan, whose phenomenal scrummaging and animated loose play was at the heart of the British and Irish Lions test series successes in New Zealand (1971) and South Africa (1974), hailed the Motherwell club for their own special contribution to the sport. The former Scotland captain presented Dragons Trophies and Medals to all players in P4 and P6 groups and spoke for several minutes on the “supreme importance” of rugby events such as the Dalziel Festival to encourage and develop grass roots rugby, which, he described as the “life blood of the game”. Also among the principal guests were Pamela Dewar of Sportsmatch Scotland, and David Waddell of the former Motherwell District Sports Council, now known as Clubsportnl. On the day, Pamela Dewar presented a cheque for £8950 to Dalziel RFC vice president Rod Harris to match a major sponsorship deal that Rod, on behalf of the club, had put in place with Europa earlier in the season. Mr Waddell said, “Clubsportnl are delighted to have had a long association with Dalziel Rugby Club and have always been impressed with their commitment to the introduction and development of young players to the sport. The Schools Festival for The Harry Morton Trophy will take place at Dalziel Park today (Friday May 6) at 10 am, with presentation to winners at around 1.30pm.